Five-a-sides are fun, but if you’re past your prime, the chance of going home with a painful injury can make a casual kickabout no longer worth the risk. 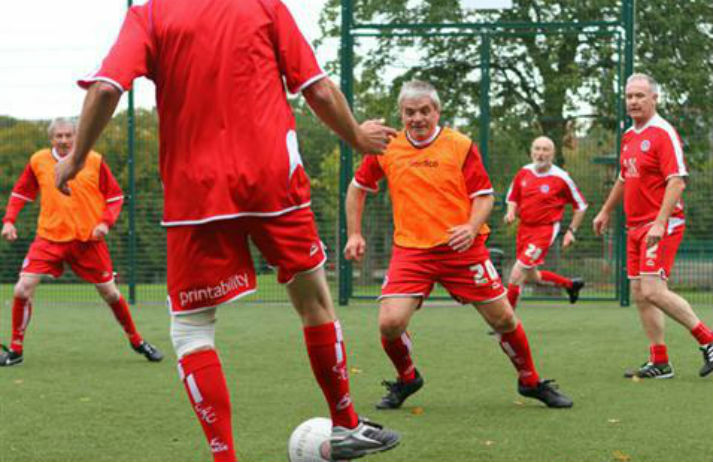 ‘Walking football’ offers the best of both worlds – a game with your mates and a low-impact form of exercise. No running allowed. Setting unrealistic goals is something we all do, especially when it comes to self-improvement. We strive to be fitter, smarter, kinder, or to eat more healthily. But shaking off old habits is hard. Sometimes we don’t even get started. Can a step-by-step app, informed by behavioural science, come to our rescue? For many lads in the UK, football is key to their upbringing. More than half a billion people watched the FA Cup final in 2013 – sports fans are a formidable group. But is rampant misogyny, hooliganism, and heavy drinking really the hallmarks of a modern footy fan? Nearly 60% of young fans in the US would rather watch sport at home than in a stadium to avoid the connectivity black hole. With high speed 4G, Wi-Fi connectivity, and a dedicated mobile app, could the Levi’s Stadium in California represent the future of live sport? With people now taking a proactive approach to their health, rather than a reactive one, a new report from Flurry Analytics shows that health and fitness apps are growing at a faster rate than the overall app market, and predicts an expansion in the wearable tech market too.